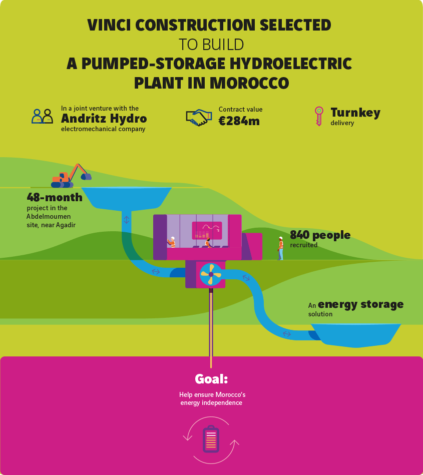 Vinci has just won a 284 million Euros contract to build the Abdelmoumen pumped storage hydroelectric plant situated 70 km from Agadir. This project is a part of the plan to develop and integrate renewable energies in Morocco. With this technique , energy is stored in hydraulic form, a hydroelectric plant of 350 MW will be built along the penstock between the two reservoirs. The civil engineering works to be carried out by Vinci Construction include earthworks for two reservoirs, excavation for the powerhouse to be embedded in the slope, and installation of the penstock pipe over a distance of 3 km, including 1 km underground. New roads will be built and several others will be refurbished to provide access to the facilities both during construction and during operation of the future site. The electromechanical equipment, for which Andritz Hydro is responsible, includes two 175 MW Francis turbines specially developed in the company’s laboratory and a high voltage substation. A total of 840 people will be recruited for the 48-month project, including 780 to be hired locally.